Ever since the Dragon Ball Figuarts toys started coming out this has been one of the most wanted characters. 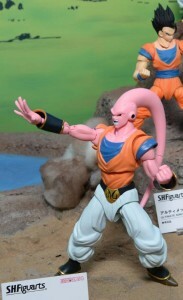 They have released the first pictures of the upcoming S.H.Figuarts Buu which is going to be released in 2015. It’s not the kid Buu we wanted but he will complete out main bad guy collection along with Prince Vegeta, Cell and the Androids. Hopfully when Buu is released it will give Figuarts a chance to focus on more lead characters like Bulma and Master Roshi.